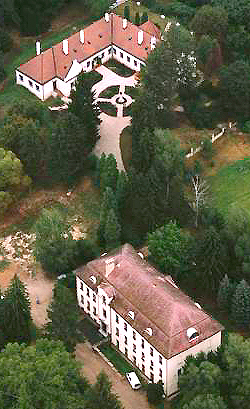 The county attracts more and more visitors with its untouched natural beauties, the romantic forests of Göcsej and Bakony, where the one-time highwayman called Jóska Sobri was hidden, as well as with the untouched wildlife of Small Balaton, the beaches of the "Hungarian sea" and the thermal baths. In Keszthely the baroque Festetics Palace awaits visitors with several exhibitions presenting the lords' lifestyle, the ornamental weapons of different periods, the trophy collection of Windischgrätz, as well as the only Carriage Museum of Hungary established in the carriage house and riding school. 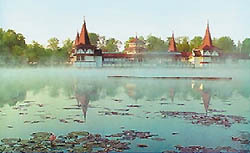 The most significant thermal bath in the county is Lake Hévíz, which is the largest medicinal lake of the world. This is the only place in Central Europe, where Indian water lilies grow in the open-air, in thermal water. In Hévíz you can find a chapel, the bare interior of which has preserved the mediaeval atmosphere. The Roman Catholic church of Keszthely was built in Gothic style. The Franciscan church in Nagykanizsa is an outstanding relic of baroque and rococo styles. In Zalaszántó you can find the Park of Human Rights, where architectural symbols are to be built to commemorate the peoples whose human rights were infringed. At the moment you can see a Buddhist stupa here, the inauguration of which was visited by the Dalai Lama. In the county seat, in Zalaegerszeg you can visit the Village Museum of Göcsej presenting the folk architecture of the region, or the Park of Finno-Ugric Ethnography with an exhibition on the architecture and lifestyle of our language relatives. A wonderful example of folk architecture is the belfry with wooden shingles and a skirt in Nemesnép. In Zalalövő, in the Villa Publica Garden with ruins you can see Roman tombstones, the restoration of a tumulus and the remains of a house with colonnades. The ruins of the Saint Adrian basilica in Zalavár is a unique sight, too, as it was built around 852-53. The finding is special as that was the largest cathedral of Eastern Europe in that period. In the Georgikon Manor Museum of Keszthely the farming of the manor and the servants' life are presented. In Zalaegerszeg, the Museum of Hungarian Oil Industry presents the relics of oil mining in Hungary including a 40m high boring tower, steam machines, swings and blow-out preventers. In Kehidakustány, in the baroque Deák mansion a memorial exhibition was opened in memory of the "wise man of the country", where the exhibits and the documents present the life and career of Ferenc Deák. The Turkish-well is the famous fountain of Nagykanizsa. According to the legend, this Turkish pool made of an octagonal stone comes from the castle of Nagykanizsa.